Newark Riverfront Revival Announces Summer 2016 Calendar of Events! It’s going to be a great summer at Newark Riverfront Park and we are excited to present another season of exciting activities and events that are fun for the whole family! This year we feature our ongoing free public fitness activities including Riverfront Yoga with fayemi shakur on Mondays at 6pm, Riverfront Zumba on Tuesday at 6pm, and our new addition, Riverfront Capoeira with Capoeira Muçurumim on Wednesdays at 7pm all located in The Meadow located on Raymond Boulevard @ Brill Street. On river activities include our popular Boat Tours along Newark’s Riverfront and inside the Port of Newark with the Hackensack Riverkeeper and free public kayaking. Suggested donations for Boat Tours are $5 for Newark residents and $15 for non-residents. Must be 5 years and older to sail. Special events this year include Riverfront Open Mic nights every 2nd Wednesday of the month, Kizomba Dance Workshop with David Campos & Guida Rei followed by the Kizomba Dance Party with DJ Express on June 18th, live music with Emily & the Ideals on July 14th, Newark Hip-Hop Weekend July 8-9th, Riverfront Theater with The Movement Musical on July 16th, Family Movie Night Newark Office of Film + TV featuring Zootopia on July 22nd in The Meadow, 2nd Annual Dance Newark! on August 6th, Riverfront Movie Night sponsored by Newark Office of Film + TV featuring Purple Rain on August 12th, Riverfront Jazz with Brick City Soul Collective on August 26th and special selections from the Newark International Film Festival on September 9-11. There is something for everyone this summer at Riverfront Park helping us to achieve our mission of connecting every Newarker to the River! This entry was posted in Uncategorized on May 27, 2016 by riverfrontcoordinator. Newark Celebrates 350 Years on the Passaic on June 4th! Big thanks the the Waterfront Alliance for featuring our upcoming 5th Annual Walk to the Water and River Day on their latest Water Wire. Every year for the past five years, the residents of Newark, New Jersey have celebrated River Day—gathering at City Hall, marching bands stepping high, to parade to the Passaic River to symbolically reclaim the riverfront and launch the summer season. This year’s parade and waterfront party—the 5th annual Walk to the Water and River Day—will take place on Saturday, June 4. And it has an extra celebratory element: the 350th anniversary of the founding of Newark. Today, more than 16 acres of public space along the Passaic River offers park-hungry Newark residents a breezy respite from urban life, with playing fields and playgrounds, a bikeway and walking trail, a boardwalk, and a floating dock. The park first opened in 2012, after four years of planning, community input, environmental cleanup, and fundraising. “We try to make River Day a snapshot of all the cultures represented in Newark, so there’s a diverse offering of entertainment and education,” Ms. DePina said, listing music, theater, poetry; yoga, zumba, capoeira, dancing; and popular boat tours with Hackensack Riverkeeper. 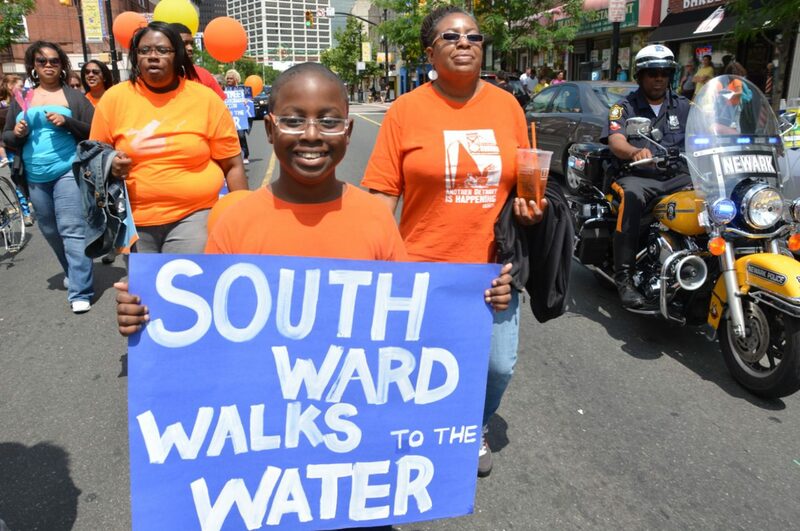 On Saturday, June 4, Walk to the Water begins at 11am from Newark City Hall (920 Broad Street); Newark River Day at Riverfront Park (Raymond Boulevard btw Somme and Van Buren Streets) runs from 1pm–6pm. Visit the Newark Riverfront Revival website for more details or follow the organization on Twitter at @NewarkRiverfrnt for up-to-date information. 5th Annual Walk to the Water & River Day Postponed Until June 4th! Due to the expected rain this weekend, the 5th Annual Walk to the Water and River Day has been postponed until our rain date of June 4th. This entry was posted in Uncategorized on May 20, 2016 by riverfrontcoordinator. May 21st – 5th Annual Walk to the Water & River Day!! Are you ready to kick of the Summer 2016 season at ‪#‎Newark‬ Riverfront Park?!?! Join us this Saturday, May 21st for the 5th Annual Walk to the Water and River Day in partnership with Newark Celebration 350! Meet on the steps of Newark City Hall at 11am and Walk to the Water in symbolic reclamation of the Riverfront for the people! This entry was posted in Uncategorized on May 17, 2016 by riverfrontcoordinator.